A monk of the Cistercian order; elected pope Dec. 30, 1334; died April 25, 1342. Although he displayed the greatest zeal for the extermination of the Albigenses and other heretics, he cherished kindly feelings toward the Jews and protected them by every means in his power. 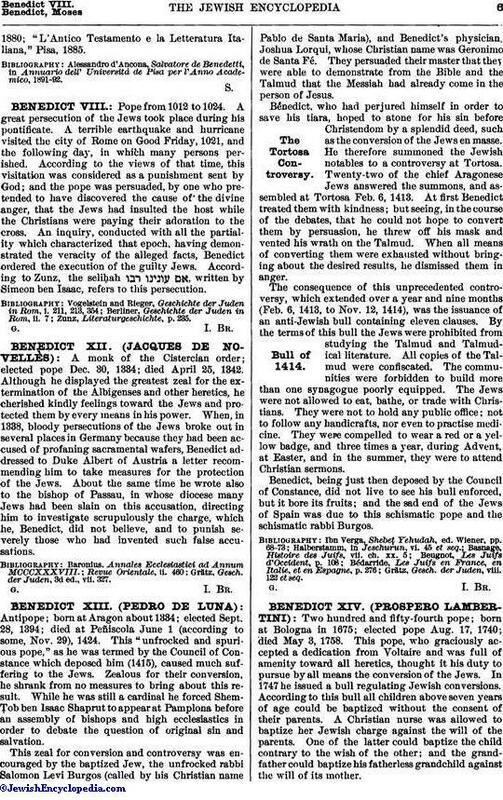 When, in 1338, bloody persecutions of the Jews broke out in several places in Germany because they had been accused of profaning sacramental wafers, Benedict addressed to Duke Albert of Austria a letter recommending him to take measures for the protection of the Jews. About the same time he wrote also to the bishop of Passau, in whose diocese many Jews had been slain on this accusation, directing him to investigate scrupulously the charge, which he, Benedict, did not believe, and to punish severely those who had invented such false accusations. Grätz, Gesch. der Juden, 3d ed., vii. 327.